Directly from the research, but also reports on specific applications: All the latest news about the topics stem cells and umbilical cord blood and the potential in modern medicine is available here for you. Enjoy reading! Vita 34 and the Chinese technology company AVIC Biology plan to set up a stem cell bank in Yinchuan together according to German quality standards. The CEO of Vita 34 AG, Dr André Gerth, and the CEO of AVIC Biology, Wang Hualin, have signed the corresponding cooperation treaty. 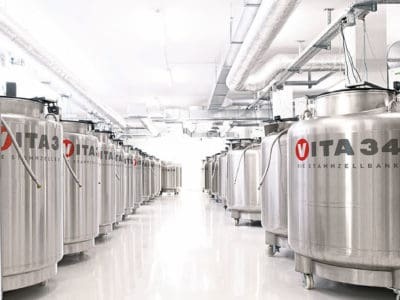 Vita 34 AG, the most experienced and largest stem cell bank in the German-speaking countries and second-largest cord blood bank in Europe, con-tinues to expand internationally. In the province of Ningxia, Vita 34 starts a collaboration with the Chinese technology company AVIC Biology Co., Ltd. This week, a very special intern started working for Vita 34 – 16-year old Jan Hömme. Jan and Arne (11 years) are brothers who have something very special in common. To fight his blood disease, Jan was transplanted the stem cells prepared from the umbilical cord of his younger brother. The Vita 34 Sibling Initiative made this successful stem cell therapy possible. The Saxon Prime Minister Stanislaw Tillich visited the biotech company Vita 34 in Leipzig. CEO Dr. André Gerth was proud to show him the production area and the cryogenic storage facilities of the European market leader.